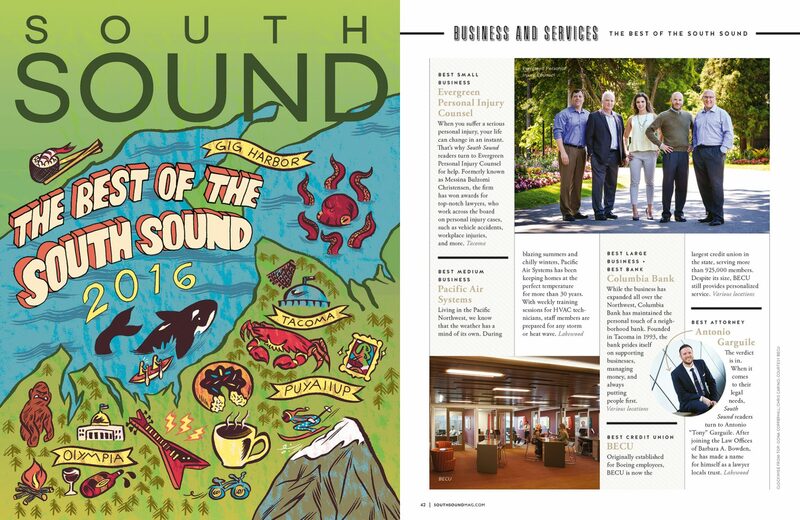 Evergreen Personal Injury Counsel is proud to be named “Best Small Business” by South Sound Magazine. We’re honored to represent this title, as there are many deserving small businesses in the South Sound. Now with our new home in downtown Tacoma’s South 9th Street, we’re reaffirming our commitment to serve our community with the highest excellence and uncompromising professional integrity. Thank you to our clients, family, friends, and the South Sound community for voting for us. Click on the image to get a closer look at our feature in the latest June/July issue of South Sound Magazine.